Can this regulator handle the supply from a 20lb propane bottle to feed a 30" fire pit ring? if not, what are the parts I would need? Even in warmer climates, a full 20 lb. tank would only be able to supply roughly 85,000 Btus and not for very long. The tank level would quickly drop, causing the tank to "freeze" as it would not be able to supply enough pressure for the burner. For something with a 300,000 btu input rating, even a full 100 lb. tank would not be able to supply enough pressure for a high capacity fire pit ring. If your fire pit ring is indeed 300,000 Btu or in this range, you need a much larger tank and a locally licensed plumber or gas fitter would need to determine the proper tank size to use based on where the tank will need to be located per both local and national fuel gas code, in addition to the length and diameter of the pipe needed to supply adequate pressure for your fire pit based on tank size. 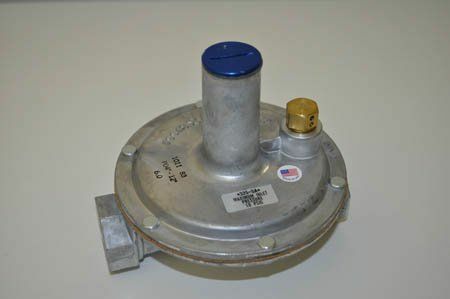 If the input is much lower, we offer a small tank kit that may be able to supply correct pressure to your burner that would include the pressure regulator and hose. We would simply need to have the Btu input of your fire pit ring and we should easily be able to locate this information via the manufacturer and model number for your fire pit ring. Is this adjustable for pressures other than 5 PSI? Will this handle from 1 to 5? I want somthing to regulate the 3 PSI pressure my home's gas has so I can fuel my fire pit. Would this regulator give me a bigger and taller flame than the 150,000 regulator would? The 300,000 BTU regulator will naturally allow for a taller flame, as the flow capacity is double that of the 150,000 BTU version. Please keep in mind that any use of a valve that is downstream of the regulator will have an effect on the flame height as well.